If you are sensitive to the rhythms of the desert, you'll know that the period from March to mid-April is a time when a special kind of natural magic can occur. All through February, if the gentle winter rains have arrived on schedule, wildflowers have been peeking their heads up out of the sandy soil, reluctant to expose themselves to the still chilly air. Now, with the increasing temperatures and longer daylight of early spring, perennials and annuals burst forth, making a spectacular show in particularly abundant years. When spring comes, I pack a camera or two, a few well-worn guidebooks and road maps, and head out to scout wildflowers. When I do, I usually follow these four easy itineraries. One of my favorite desert drives -- one of my favorite drives anywhere, for that matter -- begins on Highway 78 east of Escondido, California, a road that winds into the quiet mountain town of Julian and then drops down through picturesque mountain passes into the Colorado Desert, where a good winter's rainfall will yield an ocean of wildflowers as far as the eye can see. Head north to the hamlet of Borrego Springs, where Anza-Borrego Desert State Park headquarters lies off San Diego County Road S-22. From the headquarters, where you can pick up checklists and other publications on local flora, radiates a series of hiking trails leading into Borrego Palm Canyon and other nearby venues. The hikes range from easy to difficult (especially at the higher elevations of the canyon). If you prefer to stay in your car, however, you can follow dirt or paved roads throughout the park, continuing on along Highway 78 into the wildflower-rich desert near the Salton Sea. See what's blooming now. The Pinal Pioneer Parkway connected Tucson and Phoenix in the years before Interstate 10 was built. Now a little-traveled back road, it's a much more picturesque route than the main highway, especially in wildflower season. The parkway itself is a 42 mile-long stretch of Arizona State Highway 79, beginning in the desert uplands on the north slope of the Santa Catalina Mountains at about 3,500 feet and wending northward to just above 1,500 feet outside the little town of Florence. In winter, the parkway is lined with desert verbena, lupine, Mexican poppies, globemallow, chuparosa, penstemon and daisies. Even in dry years when other parts of the desert aren't flowering, the Pinal Pioneer Parkway always manages, it seems, to put on a good show. The parkway is marked with signs pointing out some of the characteristic desert vegetation -- saguaro, for instance, and mesquite. Pack a picnic lunch and stop at one of the many roadside tables. I always stop in at the Tom Mix Memorial, 23.5 miles north of Oracle Junction, at mile post 116, to pay my respects to the late movie cowboy. Find out what's Blooming in Arizona now. 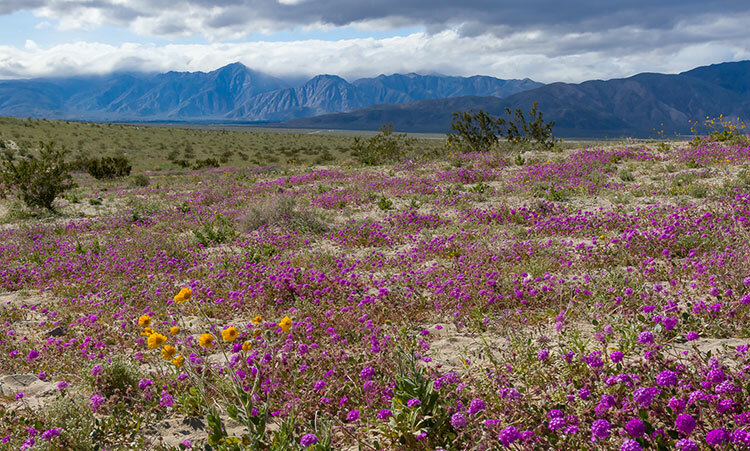 After a good winter rainfall, the high, windswept desert north of Los Angeles blossoms with an astonishing show of color. To take in that show, follow Highway 14 northeast of the San Gabriel Mountains to Tehachapi Pass, a leisurely day trip that puts you in the heart of California poppy country. Just outside Lancaster, in fact, you'll find the Antelope Valley California Poppy Reserve (15101 Lancaster Road; 661-942-0662), a protected area of 1,700 acres devoted to the state's official flower. 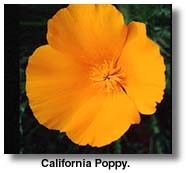 The reserve features more than 8 miles of easy trails, and many more flowers besides the poppy. If you have a few hours to spare, take Highway 18 east of Palmdale, across to Apple Valley and Lucerne Valley. The area is a paradise for wildflower aficionados, and beautiful at all times of the year. Find out what's blooming in California now. Connecting Phoenix with Las Vegas by way of the small towns of Wickenburg and Kingman, Arizona, US 93 is a narrow, winding, and sometimes dangerous route that threads across river valleys, desert flats and mountain passes, encompassing an astonishing range of biotic zones. About 25 miles north of Wickenburg, for instance, you'll come to the Joshua Forest Parkway, where an ancient remnant stand of Joshua trees carpets the hillsides for a dozen miles in every direction. Interspersed among them through the sandy soil, in season, are wildflowers of many kinds, marigolds, primroses, filler and hyacinths among them. 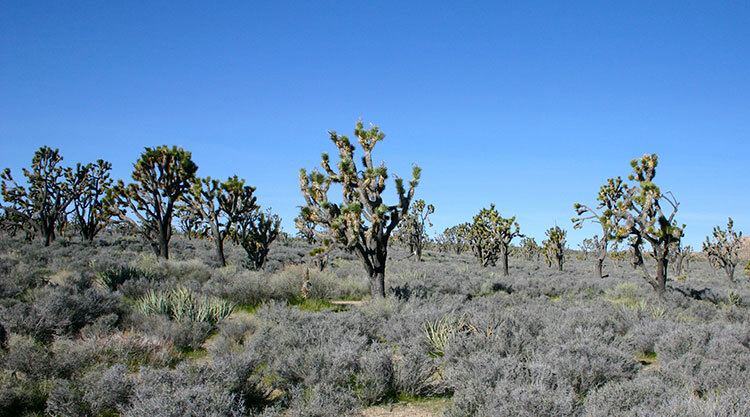 The valley of the Santa Maria River near the little town of Wikieup and the high plateau just south of Hoover Dam, where the road crosses over into Nevada, are also good places to see both Joshua trees and wildflowers. This spring could to be good one for wildflowers. Happy hunting! Where are the wildflowers blooming now?